Around 100 people from the SSUMAWOMA Malind Woyu Maklew Intellectual Forum are currently occupying PT Mayora and PT Astra’s company offices on Jalan Ternate, Merauke City. 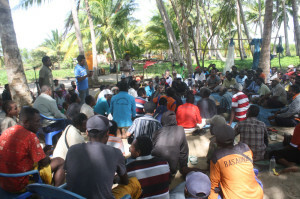 The occupation started at 11.00 local time, involving youth and community members from the Malind Muli Woyu Maklew sub-ethnic group, from villages such as Wamal, Dokib, Wambi, Dodalim and Kimam. Their demand is that the two companies stop their operations and drop their investment plans for sugar-cane plantations in Okaba, Ngguti, Tubang and Ilwayab. At the time of writing, two hours after the action started, the companies had yet to respond to the people’s demands. The action was being guarded by dozens of local police. Recently it was reported that the companies had used Brimob military police and the accusation of separatism to force people in affected villages to accept an agreement with the company. After villagers in Yowid village reported that they had been intimidated into signing PT Mayora’s document, the SSUMAWOMA forum recorded video testimony of the elders who had been forced to sign (which can be watched here: https://awasmifee.potager.org/?p=472 ). Then yesterday ( Sunday 11/8) the SSUMAWOMA forum organised a meeting and press conference in the Payum beach area of Merauke city. As tabloidjubi.com reported the discussion, there was heated argument between the people attending, but in the end all present were agreed on the need to oppose the two companies. A well-known Marind intellectual, Leonardus Moyuend, explained how villagers in the area were already feeling the pressure and can no longer sleep well. They also cannot go about their everyday activities as before, knowing about the companies’ plans to start operations around their villages. “To be honest, when the companies move in, it totally destroys the arrangement between one village and its neighbours,” he explained. The problem, Leonardus continued, was that each village would make different claims about the boundaries of their land. “We never had clear information from the government about this major program. If there is really a desire for companies to operate here, then all concerned parties such as the District Legislative Council, indigenous leaders from each village and other stakeholders should sit down with the government and investors and start discussions again from the beginning”, he said. Instead what has been happening, he said, is that companies move in to the different villages on the quiet and then tell some of the people there that they are going to invest. “This is a really bad method the companies are using. It is the reason we have a strong commitment to resist the various areas of work they are focussing on”, he said. He added that village elders had already given a mandate to local intellectuals to speak out and make interventions to oppose investment activities in their villages “We will never stay passive in the face of the companies’ efforts” he stated. Meanwhile, an indigenous leader from kampung Wambi, Wilhelmus Bole Kaize said that he had already held meetings together with local indigenous people around ten times. The outcome was always that the people of that village opposed investment. The reason was because it would destroy the natural environment the people had taken care of through the years. According to him, the area around Kampung Wambi should be used for tourism and culture. The outlook could be promising. In that way, there would be no more possibilities for corporate investors to move in. “We are completely agreed to resist the investors,” he said. 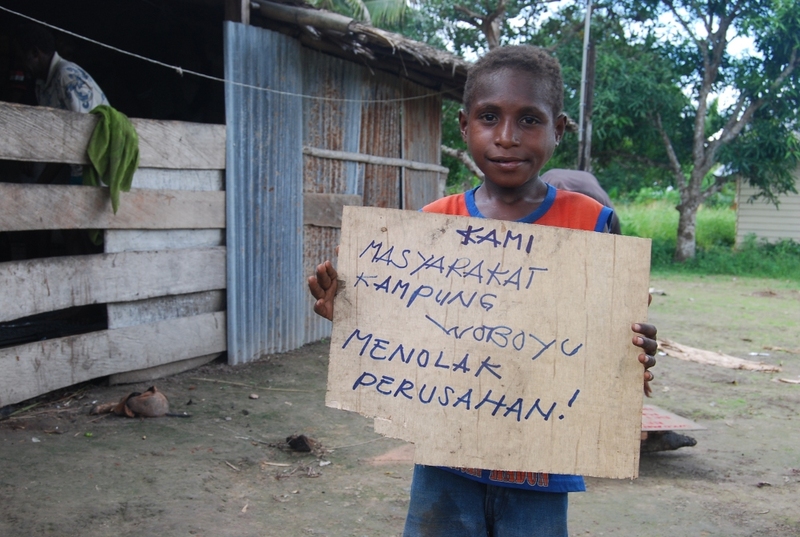 Three years after the MIFEE megaproject was launched, opening up Merauke Regency to plantation companies, initiatives by local people to organise to resist the companies appear to be on the increase. While the SSUMAWOMA forum is mostly concerned with the western part of the MIFEE area, a week ago on August 3rd another meeting brought together villagers from all over the central area of Merauke Regency. In that area companies such as Medco, Rajawali and Wilmar are operating and land is also being taken over for agriculture by transmigrants. That meeting also demanded that the government withdraw the permits for companies that are destroying the forest. Johanes Mahuze, from Tanah Tinggi explained the predicament: “Real Marind people live with the land and the forest and wildlife are kept safe. We sit, we stand and we live from the land. We carry out our traditional rituals from the land and the forest, and the animals provide our food. If the land, forest and animals are all gone and we no longer own them, then the Marind Anim people are wiped out and become Plastic Marind, having to buy what we need for our traditions from the shops. We don’t want to become Plastic Marind”. We will try to provide information on the outcome of the occupation action when we receive it. Action report received via email. This entry was posted in Merauke News and tagged Astra Group, Community Resistance, FORMASI SSUMAWOMA, Mayora Group, Office Occupation. Bookmark the permalink. Comments are closed, but you can leave a trackback: Trackback URL.